Here’s a fun one. 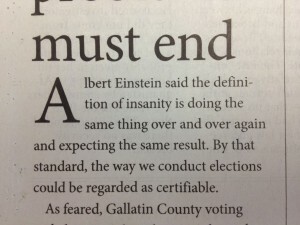 In today’s paper, we ran an editorial criticizing the way elections have been handled in Gallatin County and beyond. The editorial opens with a paraphrase of a quote from Albert Einstein. Albert Einstein said the definition of insanity is doing something over and over again and expecting the same result. Albert Einstein said the definition of insanity is doing something over and over again and expecting a different result. I regret the error. However, this is where the fun begins. According to Ryan Howes, writing in Psychology Today, the quote has been attributed to Einstein, Ben Franklin and Mark Twain. A good summary of the various places the quote has been used can be found here. Franklin and Twain are almost certainly not the sources of the quote, witty as those fellows were. Online, sources commonly attribute the quote to Einstein in his *Letters to Solovine: 1906-1955,* although no one seems to be able to produce a page from that volume that holds the quote (and Google books searches have also come up empty). However, the Wikiquote page for Rita Mae Brown has this interesting tidbit: An even earlier version of the quote can be found in the Narcotics Anonymous “Basic Text,” released in November 1981 (PDF). And here’s some more evidence that the quote was published even earlier, in a Hazelden Foundation pamphlet from 1980. 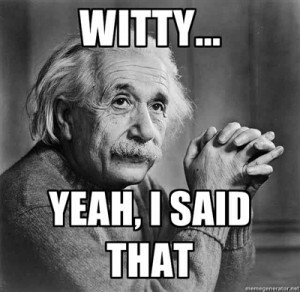 At any rate, it doesn’t look like Einstein came up with the gem, but as one of the sites I found on this wild goose chase put it: It’s not surprising that it has been attributed to Einstein, since everything but the Book of Genesis has been attributed to him at some point.